Preheat oven to 350°. Cut each zucchini lengthwise in half. Scoop out pulp, leaving a 1/4-in. shell; chop pulp. In a large skillet, cook beef, onion and red pepper over medium heat 6-8 minutes or until meat is no longer pink, breaking into crumbles; drain. Stir in tomato sauce, bulgur, pepper and zucchini pulp. Bring to a boil. Reduce heat; simmer, uncovered, 12-15 minutes or until bulgur is tender. Stir in salsa. Spoon into zucchini shells. Place in a 13x9-in. baking dish coated with cooking spray. Bake, covered, 20 minutes. Sprinkle with cheese. 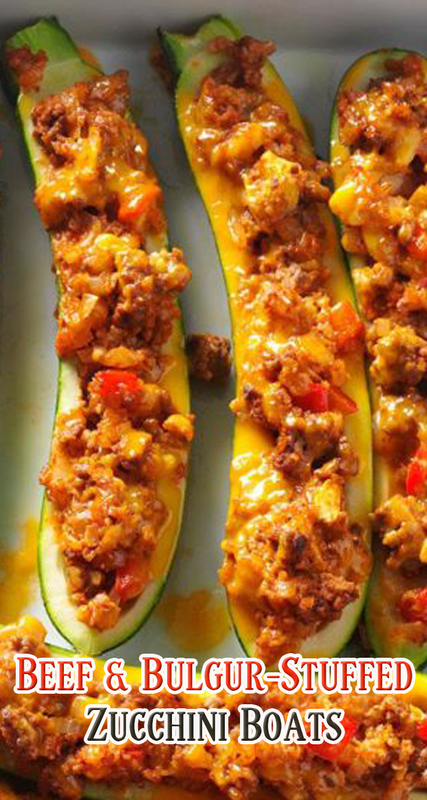 Bake, uncovered, 10-15 minutes longer or until zucchini is tender and filling is heated through.